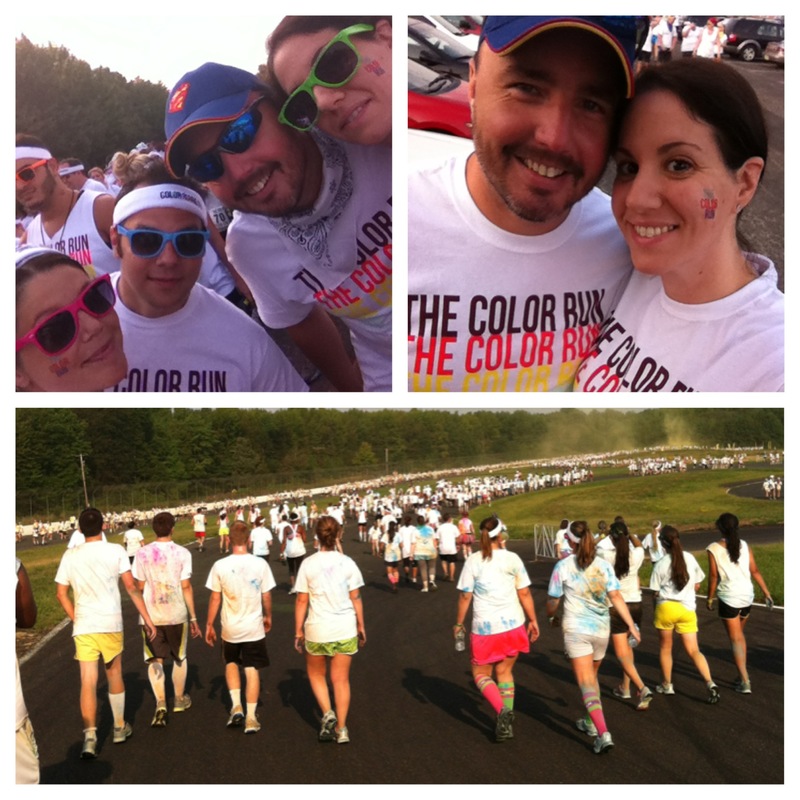 This past Saturday, my husband and I, along with our friends Corine and James (aka The Complicated’s), formed Team Color Us Awesome, and participated in The Color Run here in New Jersey. The morning of the race was a little crazy. We had no issues getting into the race venue, but The Complicated’s come from a different direction and it took them forever to enter and ended up in a completely different parking lot from us. Once we finally found each other and headed towards to start line, you were able to see just how many people were there and you could feel the excitement of those around us. We of course took some goofy photos and joked around while waiting. They were letting people start in groups of 1,000. Yes, you heard me correctly. There was no true shot of running this thing, not that I can last a full 5K without stopping to walk for a bit, unless you arrived VERY early or VERY late. We were all just looking to have fun and The Complicated’s are not serious runners either, so it was all good. The course was broken into zones and each zone had it’s own color. You would run/walk for awhile, hit a color zone and people who were working the event would throw colored corn starch at you that matched the zone you were in ie: blue, yellow, green, pink or purple. It was fun to see people rolling around on the floor in the color and people trying to scoop it off the ground to throw at their friends. At the end of the 5K, (which took us about 45 minutes) there was a huge after party. All of the color filled (and not so pleasant smelling) people crowded in front of a stage and DJ booth to dance, cheer and catch additional color packets to be tossed up in the air at 15 minute intervals. They also had photo stations where you could have team photos taken by professional staff. (I’m hoping to have those back soon). Overall, The Color Run was a fun experience and it is something I would do again. I’m a fan of these group 5K events and if I had the time I’d absolutely attend this one happening next month, because who wouldn’t want do to a 5K, while being chased by Zombies, flag football style?! 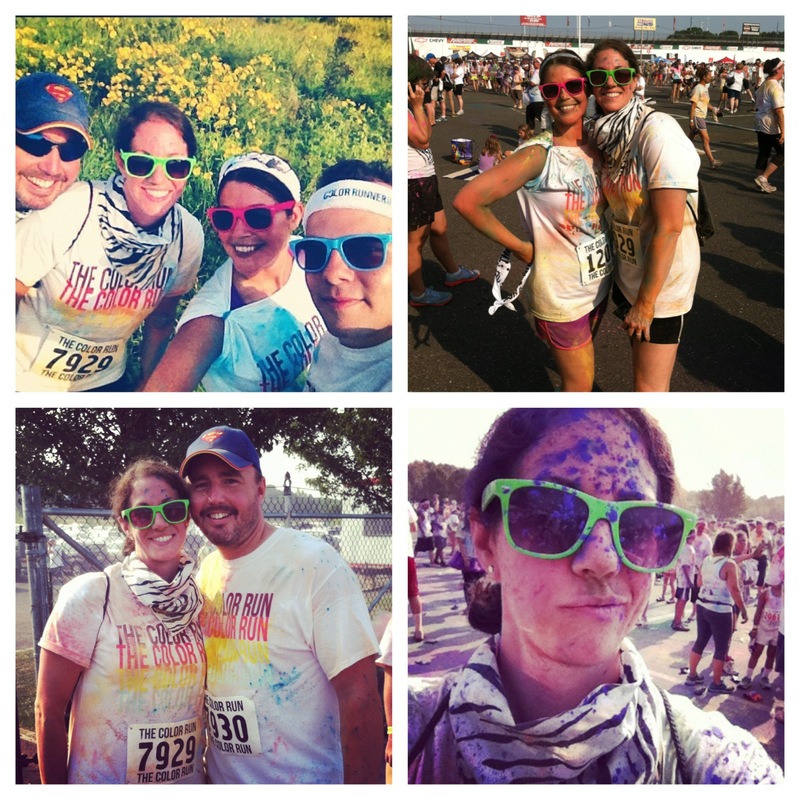 Top Left: Team Color Us Awesome at the starting line. Top Right: Hubs and I pre-race. Bottom: Color Crawl in full swing. Top Left: Corine had to a have photo of us by the pretty flowers! 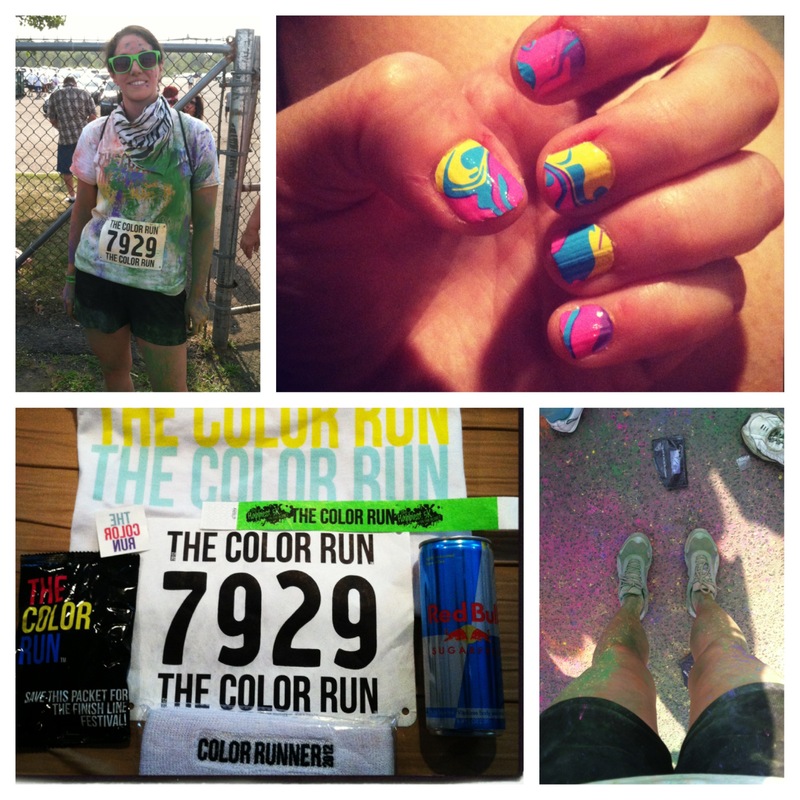 Top Right: Princess Rainbow Sparkle and myself, post race. Bottom Left: Hubs and I post race. Bottom Right: Me in all my technicolor glory. Right: In the middle of the crowd at the after party. Top: In the middle of the color madness. Middle: Mike’s shirt, post run. Bottom: Having the color blown off of me by a guy with a leaf blower. SMH. Oh, and for those of you wondering… clean up wasn’t awful, but it wasn’t fun either. I had color in places where I didn’t think color could get! I tell ya what….you sign up for next year and as long as I still have a free place to stay with my buddy….I’ll come do it too! I think that sounds like a fantastic idea!!!! Maybe everyone can join in – including those hosting your free place to stay! Absolutely! I think it would be a really good time. We’d also have plenty of time for cheesy team shirts!